SMT-LIB 2 scripts, which includes all the benchmarks available from the Benchmarks section, refer to one of the following sub-logics of the main SMT-LIB logic. The reason to have a (sub-)logic is pragmatic: to identify fragment of the main logic where it may possible to apply specialized and more efficient satisfiability techniques. New logics are added to the standard opportunistically, once enough benchmarks are available for it. Here is an overview of the logics listed below, ordered by inclusion. A link from a logic L1 to a logic L2 means that every formula of L1 is also a formula of L2. Click on the node to go to its description. Then, click on the logic's name to see its specification in SMT-LIB format. The reason for this, admittedly idiosyncratic, nomenclature is mostly historical. Also historical is the fact that some logics impose further restrictions on the language. For instance, in the *A*LIA logics the only array sort allowed is (Array Int Int), whereas in some A*IRA logics the only array sort allowed are (Array Int Real) and (Array Int (Array Int Real)). 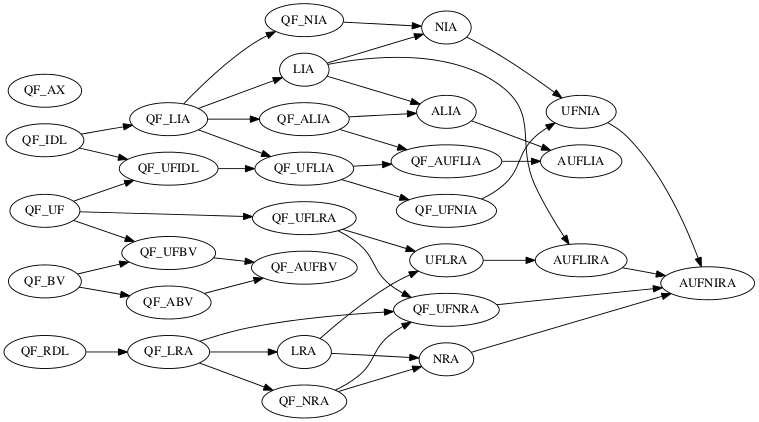 This is why, for instance, QF_AX is not a sublogic of QF_AUFLIA or QF_ABV. Finally, benchmarks are typically classified by the smallest logic they belong to. One consequence of this is that we do not have a logic such as RA here, for instance, since an RA benchmark belongs to either LRA or NRA. Click on the logic's name for a full description. Note:The listing below is currently incomplete. More will be added later. Closed formulas over the theory of linear integer arithmetic and arrays extended with free sort and function symbols but restricted to arrays with integer indices and values. Closed linear formulas with free sort and function symbols over one- and two-dimentional arrays of integer index and real value. Closed formulas with free function and predicate symbols over a theory of arrays of arrays of integer index and real value. Closed linear formulas over linear integer arithmetic. Closed linear formulas in linear real arithmetic. Closed quantifier-free formulas over the theory of bitvectors and bitvector arrays. Closed quantifier-free formulas over the theory of bitvectors and bitvector arrays extended with free sort and function symbols. Closed quantifier-free linear formulas over the theory of integer arrays extended with free sort and function symbols. Closed quantifier-free formulas over the theory of arrays with extensionality. Closed quantifier-free formulas over the theory of fixed-size bitvectors. Difference Logic over the integers. In essence, Boolean combinations of inequations of the form x - y < b where x and y are integer variables and b is an integer constant. Unquantified linear integer arithmetic. In essence, Boolean combinations of inequations between linear polynomials over integer variables. Unquantified linear real arithmetic. In essence, Boolean combinations of inequations between linear polynomials over real variables. Difference Logic over the reals. In essence, Boolean combinations of inequations of the form x - y < b where x and y are real variables and b is a rational constant. Unquantified formulas built over a signature of uninterpreted (i.e., free) sort and function symbols. Unquantified formulas over bitvectors with uninterpreted sort function and symbols. Difference Logic over the integers (in essence) but with uninterpreted sort and function symbols. Unquantified linear integer arithmetic with uninterpreted sort and function symbols. Unquantified linear real arithmetic with uninterpreted sort and function symbols. Unquantified non-linear real arithmetic with uninterpreted sort and function symbols. Linear real arithmetic with uninterpreted sort and function symbols. Non-linear integer arithmetic with uninterpreted sort and function symbols.